Review: It is the year 1944 and World War II is reaching its climax. The Walmington-on-Sea Home Guard platoon must help MI5 to uncover a German spy. About a year ago I did watch an interesting program on how these two guys had the idea about Dad’s Army and how they were trying to get the T.V. series made. As far as this film is concerned, the best thing about this movie is the cast list. The one actor that I thought was brilliant and stood out for me was Toby Jones. All the cast give terrific performances. You could actually see how much they enjoyed making the film and how well they all got on together. Laughed a few times during the film but I found that most of the funny scenes in this I had already seen in the trailer so it almost ruined it for me. They showed too much in the trailer. I could only just barely give this 3 out of 5. The script could have been better written. It wasn’t as funny as I thought it was going to be. I am just not sure who the target audience is for. It is the sort of film that you can sit down to on a Friday night and watch after a hard week at work and passes the time by. 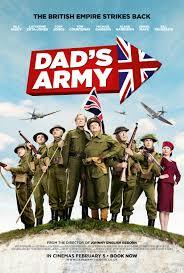 There has already been a Dad’s Army film made way back in 1971.